Chris Ward wrote a good overview of our blink(1) USB LED over at SitePoint. It goes over our Blink1Control app as well as IFTTT integration and "hacking" the blink(1) via the HTTP REST API. If you're new to blink(1), check it out! This is really neat. Scratch is a free and open-source visual programming / learning environment. It's somewhat targeted at kids but really it's good for anyone new to programming concepts. It looks like Scratch supports several USB devices now, including blink(1). Check out this blog post for more info. Niklas was recently "nerding out with a open api, raspberry pi, blink(1) and some node.js code" and created a cool example of using Stockholm bus tracking API to light up a blink(1) that lets him know when he should leave for the bus. And since it's all running on a Raspberry Pi hanging on his wall, it's a compact easy-to-see single-purpose device. Check out his blog post "A Nerds Way of Keeping Track of When the Next Bus Leaves" and github repo for full details. Lua is a very interesting and efficient programming language that's exceptionally cross-platform. Since our blink(1) notification light is also very cross-platform, we've always wanted native Lua functionality for it, but haven't had to resources to do it. Fortunately, Matt Burke made a great Lua library for blink(1) and put it up on github. Thanks Matt! 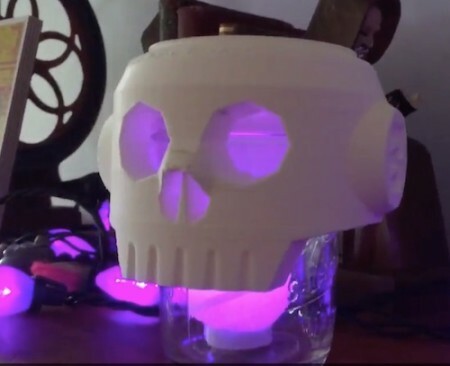 For Halloween, John Park made some wonderful flickery props using a BlinkM, a BlinkM MaxM, 3d printed parts, and LEGO. Check them out on Twitter and below. Thanks JP! ThingM's blink(1) USB notification light is now on Amazon US! We are super excited about this and are honored to be part of the brand new Amazon service called Amazon Launchpad. Launchpad is a curated site for cool crowdfunded products, much like other curated product sites you might be familiar with. But this one is backed by Amazon's awesome fulfillment infrastructure. We're still getting our blink(1) page set up and stock sent to their warehouses, but we're in the system and Amazon is taking orders and gauging demand. His original writeup is here, along with the code on github. We love Node.js. In many ways it's the future. For those of you who also like Node and want a simple example of how to use node-blink1 or just need an HTTP-to-blink(1) adapter without running Blink1Control, here's node-blink1-server. It's the first of many Node projects we'll be creating. Cody Matthieu wrote up a neat HOWTO on hooking up a Bluetooth Low-Energy (BLE) Polar Heart Rate monitor to a blink(1) notification light with the Octoblu device integration framework. (and doing testing with the very good LightBlue Explorer app from Punch Through) It's a really neat idea and yet another interesting case of assuming we always have a BLE-to-Internet gateway in our pockets thanks to modern smartphones.